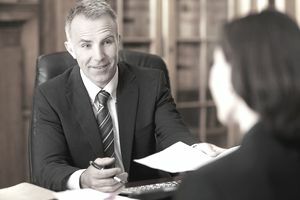 A personal representative is an individual you place in charge of settling your estate after your death, also sometimes referred to as an executor -- or executrix if she is a female. Sometimes the personal representative of an estate without a will is called an administrator. A "testate" estate is one that has a valid last will and testament. A will should -- and usually does -- name the individual the decedent would like to serve as his personal representative or executor. Courts almost invariably honor the decedent's wishes if the person he named is still alive and is otherwise able to serve. Why wouldn't the person named as personal representative in the last will and testament legally be allowed to serve? This can happen if he doesn't meet all the criteria under the state's law. He might have been convicted of a crime, or he's suffered some mental decline that would prevent him from meeting his duties. Maybe he's not yet legally of age. Minors and convicted felons typically can't serve as personal representatives, nor can banks or trust companies that don't have fiduciary powers in the state where probate is taking place. Some states have more specific rules. For example, a person can't serve as a personal representative in Florida unless he is related to the decedent by blood or marriage, or, if he's not, he is a Florida resident. Beneficiaries or heirs can contest a will and object to the personal representative the decedent named in his will. This usually results in a full-blown trial where the beneficiaries and others can present evidence and testimony to convince the judge to overturn the provisions of the will or to honor them. Courts usually prefer to honor the decedent's wishes whenever possible. When a will is contested over who has been named as personal representative, the judge will make the ultimate decision as to who will serve -- the personal representative named in the will or perhaps another party nominated by the beneficiaries, or someone else entirely that the judge selects. These rules and laws can vary from state to state. What holds true in Florida might not be the case in New Hampshire. If you're planning your will and you're unsure about the person you want to name, check with a local attorney. If the decedent didn't have a last will and testament, the intestacy laws of the state where he lived at the time of death take over. The court will determine who has priority to serve as personal representative in this case, and the position is often called the "administrator" of the estate. It's usually the surviving spouse, but if she is unwilling or unable to take on the responsibility, a surviving child or children may be appointed. The judge will work down a list of kin until someone appropriate can be appointed, maybe a surviving parent, sibling, niece or nephew, or someone steps forward to request the job. Typically, if the decedent's heirs-at-law -- those entitled to inherit from him without a will -- can agree on who should serve, the probate judge will simply appoint that person. But if the heirs-at-law don't agree, the probate judge will make the decision based on state rules and statutes.